Adhesive: a substance capable of the surface bonding together of materials. AIM Internationali s a global affiliation of trade associations. Algorithm: a set of steps taken to make a desired calculation. Alphanumeric: character set made up of digits and letters of the alphabet. Ampoule: single dosage container made from glass sealed after filling by fusing the glass neck. ANA (UK): Article Numbering Association. Application weight: he amount of adhesive or other coating per unit area. Artwork: copy supplied for origination purposes, indicating colour separation and half-tones. ASCII: American Standard Code for Information Interchange (a computer code consisting of 128 alphanumeric and control characters used for the exchange of information between computerised systems). Aseptic packaging: a system in which the product is sterilised before filling into pre-sterilised packs under aseptic conditions. Auger feed: screw feeder used to discharge known volumes of powder or paste products. Auto discrimination: the ability of a bar code reader system to distinguish automatically between two or more symbologies. Bar code: an array of parallel rectangular bars, arranged according to specific rules, to represent data in machine-readable form. Bar code character: a group of bars and spaces within a bar code that represent a single letter, number or character. Bar code density: the number of characters that are represented in a bar code per unit of length (characters per inch, cpi.). Bar code reader: a device used to capture the data encoded within a bar code and convert it into computer compatible data or a human readable characters display. Bar code symbol: the combination of characters required by a particular symbology that makes up a scan able entity. Batch code: combination of characters that facilitates tracing of the product to the batch in which it was processed (see LOT). Bioburden: population of viable microorganisms on an item (ref. ISO 11607:2003(E)). Biodegradable: degradable under natural conditions, e.g. in landfill. 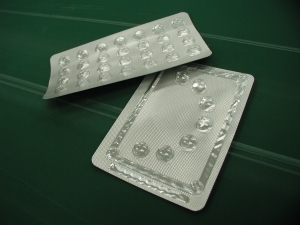 Blister pack: a piece of thermoformed material bonded to flat material to form a closure (lid). Blister packer: a system to fill, lid and seal blister packs. Board: papers equal to or greater than 220gsm. Bond: the union of two substrates. Bowl feeder: vibratory bowl used to feed components up a spiral ramp. Calliper: the thickness of a sheet of board. Carton:a container made from folding boxboard and supplied flat for erection when filling. Carton blank: an unglued carton, which is glued during the filling process. Cartonboard: material of defined substance and thickness made from one or more layers of paper to form a rigid or semi-rigid sheet. Cat’s whisker: the sharp pointed protrusion from a blister that can arise when using a cross cutting blade and slitter to cut out individual packs on a form fill seal machine. Cavity wall: a carton or fitment where the sidewalls are constructed so as to form a hollow frame effect. Chase:a frame used for locking cutting forms in place. Check character (check digit):a character calculated from the numerical value of the other characters in the code that is used to ensure that the code is correctly processed. Chevron pouch:a pouch where one end seal is in the shape of a chevron (like sergeants stripe). EXAMPLE: Repeated folding to construct a tortuous path (ref. ISO 11607:2003(E)). Closure integrity:C ondition of the closure that ensures that the closure presents a microbial barrier to at least the same extent as the rest of the packaging (ref. ISO 11607: 2003(E)). Compliance qualification: Documented evidence that packaging meets the requirements for packaging for terminally sterilized medical devices based on testing for conformity to an agreed material specification (ref. ISO 11607: 2003(E)). Code 39 (3 of 9): a bar code symbology that encodes 43 data elements (0-9, A-Z and 7 special characters). Each character has 9 elements, bars have two widths. Code 128: a bar code symbology that encodes the complete 128 ASCII characters set. Characters are made up of bars and spaces in three widths. Co extrusion: a multi-layer structure prepared by extruding a number of polymers through a single die (with tie layers as necessary). Cohesive failure: failure of a bond within the adhesive itself. Contaminants: any unacceptable or unintended trace materials. Corrugated board: board consisting of one or more fluted sheets between flat facing plies. Crash-bottom carton: a carton where the base panel locks in place when the body is squared up. Crashlock base: a carton where the base locks in place automatically when pressed from opposite corners. Development: process of refining a prototype design or process to meet established product criteria (ref. ISO 11607: 2003(E)). Die: (i) solid sheet or cylinder into which knives and rules are fixed to create carton shapes. Die: (ii) solid sheet or cylinder into which knives are fixed to create label shapes. Die-cut labels: labels that are cut to shape by a cutting die. Double tuck carton: carton in the form of a sleeve, with extended side flaps that tuck in to form the end closures. DSCSA: The Drug Quality and Security Act (DQSA), was signed into law by President Obama on November 27, 2013. Title II of DQSA, the Drug Supply Chain Security Act, outlines critical steps to build an electronic, interoperable system to identify and trace certain prescription drugs as they are distributed in the United States. Duplex board: a multi-ply board mainly made from mechanical pulp with a bleached chemical pulp facing layer. EAN: Originally European Article Number and now used to denote International Article Number and the International Article Numbering Association. EAN-8: Short form, 8-digit version of the International Article Number. EAN-13: Full 13-digit version of the International Article Number. Expiry date. Expiry(Exp) Date Nov 2001 means do not use this product after November 2001. Failure: event in which a component of the package does not perform one or more of its required functions within the specified limits under specified conditions (ref. ISO 11607: 2003(E)). Failure analysis: logical, systematic examination of an item to identify and analyze the probability, causes and consequences of potential and real failures (ref. ISO 11607: 2003(E)). Field: an area in a computer file designated for one item of data. Film: a non-fibrous, non-metallic flexible material available in a range of thickness. Final package: primary containment system in which the product is sterilized (excluding shelf cartons and shipping containers) that protects the contents to the intended level over a specific period of time. Note The intended level may be e.g. a barrier to physical, microbial or chemical challenges (ref. ISO 11607: 2003(E)). Flexography: a rotary printing process that prints by the use of flexible relief plates that directly apply the image to the substrate. Foil: rolled metal in flexible sheet form. Typically this is aluminium sheet, available in a range of thickness. Form/fill/seal: a system where packs are formed (typically from film or foil), filled and closed in one continuous operation. Gravure: a printing process where the image is engraved (electronically or chemically) in the form of cells in the surface of a metal cylinder. Ink is transferred to the substrate by passage between the inked cylinder and an impression cylinder under pressure. Guard bars: auxiliary characters at both ends and centre of EAN/UPC bar codes which provide reference points for scanning and act as start/stop characters. Gusset: the folded inward portion of a flexible bag. Heat-seal able film: film that may be joined to itself or another substrate through the use of heat and pressure (without the use of adhesives). Heat-sealing: joining together by using heat and pressure. Heat-sealing adhesive: an adhesive coating previously applied that forms a bond between two surfaces when heat and pressure is applied. Heat shrinking: application of heat to shrink a band of plastics material around product. Impulse sealing: short rapid electrical resistance heating of metal strip or wire to seal plastics film. Ink Jet Printing: non-contact printing process that uses a modulated jet of ink to spray the image onto the substrate. Label : ASTM, D 996 defines “label” as “a piece of paper or other material to be affixed to a container or article, on which is printed a legend, information concerning the product, or addresses. It may also be printed directly on the container”. “all labels and other written, printed, or graphic matter (1) upon any article or any of its containers or wrappers, or (2) accompanying such article” at any time while a device is held for sale after shipment or delivery for shipment in interstate commerce. Labelling: Council Directive 92/27/EEC of March 1992 on the labeling of medicinal products for human use and on package leaflets defines “Labelling” as “information on the immediate or outer packaging”. Labelling System : assembly of the package and label and any supplied information on usage that is included within or in contact with the final package (ref. ISO 11607: 2003(E)). Labelling System :t he means by which information is controlled and applied to a packaging component. Laminate: a material made by joining together complete surfaces of any combination of films, foils and papers. Letterpress: a printing process where ink is transferred from raised areas to the substrate under pressure. Lidding Stock: material used to seal a blister pack. Lithography: a printing process in which oil based ink is transferred from ink retaining areas on a treated plate to a substrate. Water is used to contain the ink in the required areas. In offset lithography the image is transferred first to a rubber blanket and then the substrate. Life Cycle Analysis:t he measurement and aggregation of all factors relating to the production, use and disposal of materials. Manufacturer: natural or legal person, individual or organization with the responsibility for packaging and/or sterilizing the medical device (ref. ISO 11607: 2003(E)). Manufacturer Number: the digits allocated by an EAN numbering authority to a labeller which, together with the prefix, item reference and check digits, make up the standard article number. Manufacturer’s joint: the part of a case that is joined together by the manufacturer. Metallised films:f lexible films coated with an ultra-thin layer of metal, usually aluminium. Microbial barrier: attribute of the packaging system that prevents the ingress of microorganisms under specified conditions (ref. ISO 11607: 2003(E)). Modified Atmosphere Packaging: a process by which air in a pack is replaced with another gas. MVTR: Moisture Vapour Transmission Rate is the quantity of moisture transmitted (through a barrier) during a specified period of time. One-trip: pack or container designed for single use only. 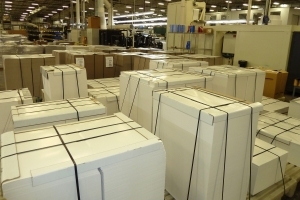 Over wrap: a wrapping enclosing one or more packs. Package integrity: unimpaired physical condition of a final package. 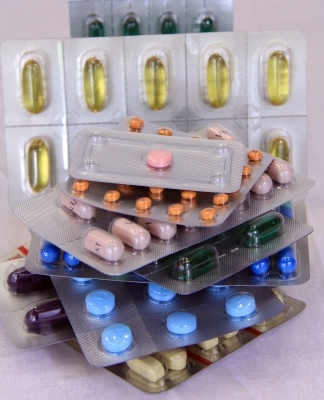 Packaging compatibility: attribute of the packaging material and/or system to allow it to achieve the required performance without detrimental effect on the medical device (ref. ISO 11607: 2003(E)). Packaging material: any material used in the fabrication or sealing of a packaging system or primary package (ref. ISO 11607: 2003(E)). Packaging system (1): one or more packaging materials assembled into a single unit intended as part or all of a primary package (ref. ISO 11607: 2003(E)). Packaging system (2): process by which one or more packaging materials are formed into a product container. 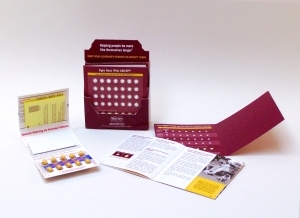 Parallel tuck carton: a carton with both tuck ends attached to the same panel. Partial over wrap: a wrapping partially enclosing one or more packs. Peel strength: the measured stress through peeling of a bonded surface resulting in an adhesive failure. Performance qualification: documented evidence that packaging meets the appropriate requirements for sterile packaging based on testing of the particular packaging material for compliance with the applicable requirements of thisinternational standard (ref. ISO 11607: 2003(E)). Eastar PETG: copolyester 6763, a glycol-modified polyethylene terephthalate, is a clear amorphous polymer. The modification is made by adding a second glycol, cyclohexanedimethanol, during the polymerization stages. Plug: a push fitting closure. Plug lid: a removable lid that is a push fit into the opening of a container. Pouch: a rectangular bag with three sides sealed prior to filling and closing. Primary Pack: the definition of this term in EN 868-1 is synonymous with the above definition ofFinal Package(ref. ISO 11607: 2003(E)). Primary package: sealed or closed packaging system that forms a microbial barrier, enclosing a medical device (ref. ISO 11607: 2003(E)). Printer-slotter: a printing machine which also converts corrugated board into cases using simple wheel or cross creasing and punch-slotting devices. Producer: natural or legal person, individual or organisation with the responsibility for manufacturing the packaging material and/or system (ref. ISO 11607: 2003(E)). Product: combination of both the medical device and/or additional components with the final package (ref. ISO 11607: 2003(E)). Push fit closure: a closure, usually plastic, that is pushed into the neck or opening of a container to form a seal and is held in place by friction. Qualification: documented evidence that all specified design and performance requirements are met (ref. ISO 11607: 2003(E)). 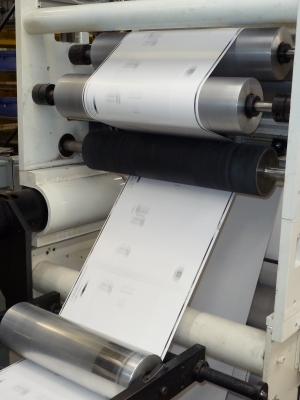 Release coating: coating applied to label backing paper to aid removal of self-adhesive labels. Release paper: easily removed backing paper for self-adhesive labels. Relieved area: an area, outside the product containment zone, that is designated to remain not sealed; this is to facilitate ease of opening. Revalidation: documented procedure to reconfirm an established validation (ref. ISO 11607: 2003(E)). Reverse tuck in end carton: carton where the end tuck flaps are extensions of opposite carton faces. Sachet: a small flexible package made by bonding two layers together on all four sides. Seal: result of joining of packaging layers. NOTE: A seal may be created, e.g., by use of adhesives or thermal fusion (ref. ISO 11607: 2003(E)). Note: In EN 868-1 the definition of this term differs slightly (ref. ISO 11607: 2003(E)). Seal strength: mechanical strength of the seal (ref. ISO 11607: 2003(E)). Self-adhesive: an adhesive that bonds by pressure only. Used for pressure-sensitive labels. Self-checking: denoting a bar code system using a checking algorithm. 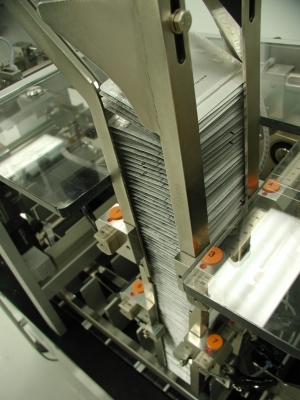 Serialization: Serialization requires a comprehensive system to track and trace the passage of prescription drugs through the entire supply chain. 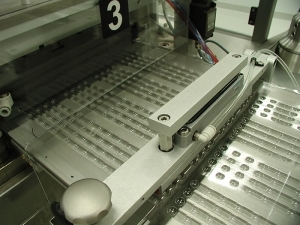 Serialization could potentially identify every product by a unique serial number in addition to the origin, shelf life and batch number for that product. This could potentially allow the product’s lifecycle to be traced from production, through distribution, and finally to the patient. Shaft encoder: a device, for measuring the speed of an object, that converts this information into a series of signals, which may be interpreted by an ink jet printer. Shelf life: the period of time during which a packaged product retains its minimum acceptable quality or safety. Shrink-banding: heat tightening of a band of plastic material, to collate goods or seal a closure (may alternatively be achieved by moisture loss from a cellulose band). Shrink wrapping: over-wrapping in plastic film, which retracts when heated to produce a tight wrap. Skin packaging: using vacuum to pull heat-softened plastic film tightly over a product whilst sealing the film to an underlying porous surface. Start/stop character: a bar code character included in a symbol to indicate to the scanner the beginning and end of the code. Sterile: free from viable microorganisms. NOTE: For the purposes of EN 868-1, the term “sterile” is defined in EN 556 (ref. ISO 11607: 2003(E)). Sterile fluid-path packaging: system of protective port covers and/or packaging designed to ensure sterility of the portion of the medical device intended for contact with fluids (ref. ISO 11607: 2003(E)). Sterile barrier system: the means by which a manufacturer ensures that a sterilized device remains in a sterile state until used in the manner intended. Typically such a system comprises a sealed unit surrounding the device that is an integral part of the product. When a healthcare professional purchases a sterile medical device, sterility is part of the product (ref. EUCOMED-ESPA Position Paper: Sterile barrier systems and Directive 94/62/EC). Sterilization compatibility: attributes of the packaging material and/or system that allow it to both withstand the sterilization process and attain the required conditions for sterilization within the final package (ref. ISO 11607: 2003(E)). Stretch wrapping; a method of wrapping/collating product with an elastic film under tension. Symbol length: total length of a bar code including the quiet zones preceding the start code and following the stop code. Symbology: the system of representing data in a bar code. Tamper-evident closure: a closure that incorporates a feature that indicates any unauthorised tampering or interference. Terminally sterilized: term for medical devices that are sterilized after being completely sealed or enclosed in at least the primary package. Thermal printing: the system whereby direct heating of the paper by the print head produces an image. Thermal transfer printing: the system where the heating, by a print head, of an ink layer on a thin film, causes ink to be released and transferred to a substrate. Thermoforming: a process where film softened by heat is forced into or over a mould. Thermoform/fill/seal: a system where packs are thermoformed from a plastic sheet; then filled and lidded in one continuous operation. Thermoplastic: a plastic that softens when heated and re-hardens when cooled. Track and Trace: Track is to understand current and past locations of a serialized item. Trace is to understand the history of who came into contact with the item along the supply chain. Tyvek®: a Dupont product. Non-woven spun bonded, polyethylene sheeting with good bacteria penetration resistance; made from very fine, high-density polyethylene fibres. UCC: Uniform Code Council, the American organisation that administers the UPC system in North America. UPC: Uniform Product Code, the American standard article number. Use by date: Use by Nov. 2009, means do not use this product after 31st October 2009. User: natural or legal person, individual or organization with the responsibility for making use of the product (ref. ISO 11607: 2003(E)). Vacuum pack: a package from which the air has been withdrawn before sealing. Vacuum packaging: the withdrawal of air from a pack immediately prior to sealing its closure. Validation: documented procedure for obtaining, recording and interpreting the results required to establish that a process will consistently yield product complying with predetermined specifications (ref. ISO 11607: 2003(E)). Accelerated aging – artificially seeing how a medical product will age without waiting for it to age in real-time. Using heat and pressure, the product is quicker to the shelf. The process is based on conditions that stimulate the effects of aging on materials. Anti-counterfeiting– methods of ensuring the validity of products to prevent occasions of counterfeit. Drugs can be stolen, inaccurately reproduced, resold, or merely replaced with a placebo. This can cause problems in brand protection, and in the health and safety of consumers. Tamper-evident seals, unique carton numbers, bar code printing, and RFID are methods of product tracking that prevent counterfeiting. CFR 21 part 11– an FDA (US Food and Drug Administration) code of federal regulations (CFR) issued March of 2000 requiring electronic records and signatures for products. Importance of keeping up-to-date with technology was stressed. Systems validation, audit trails, time stamps, general security and archiving became requirements. The current requirements are under constant revision as technology changes. 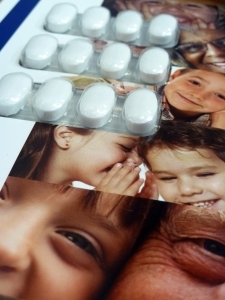 Child-resistant– a way of sealing a product to prevent a child from opening it, usually in the line of pharmaceuticals or products that would cause children harm. Packages often require a dexterity that comes with age, or a series of opening steps that have to be read on the package. Clinical trials– trials done on set groups of consenting patients to determine the effects of a product. Medical research on real humans provides the best clue into consumer reactions and they have the best results when staff and patients follow the protocol and keep in frequent contact. Ethical and legal medical practice codes still apply and though there are risks, there are great medical benefits as well. Cold chain– a temperature-controlled supply chain. Hopefully uninterrupted, its a series of storage and distribution activities which maintain a given temperature range. Temperatures depend on the product, but many products like vaccines are ineffective if cold is not maintained. Often the range is 2-8 degrees celsius. Combination product– a product comprised of two or more components, drug/device, drug/biologic, or drug/device/biologic either mixed into one entity, packaged separately but bought together as a unit, or bought separately with the intention of using them together. An inhaler is an example, where a drug is intended to be taken with a device, and though they are bought separately, they combine in intention. Current good manufacturing practices (cGMP)– regulations issued by the FDA as minimum requirements. Most countries have their own, and they require quality systems of design, manufacture, packaging, labeling, storage, installation, and servicing of medical devices. Going beyond samples, the entire system is expected to be up to par, and documentation facilitates this. Dietary supplement– vitamins, minerals, herbs, or amino acids. Dietary substances intended to supplement the diet and intended for ingestion in pill, capsule, tablet, powder, or liquid form. Labeled as a dietary supplement, and not represented as real food or as a sole ingredient to a diet. FDA recalls– the action needed when the FDA doesn’t approve of a food or drug item. If it doesn’t fit into the guidelines for safety and efficacy of pharmaceuticals, the company often will recall the item themselves, but in serious situations the FDA will have to inform the public. Class I recalls – reasonable probability that it’ll cause injury or death. Class II – exposure may cause temporary injury. 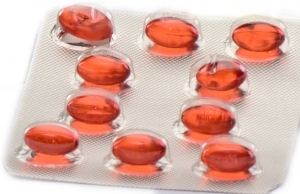 Class III – unlikely to cause adverse health reactions, but just wrong labeling or manufacturing regulations. Inhalers– a medical device used to deliver medication into the body via the lungs. It’s a combination product combining a drug and a device that need to be delivered together. Lyophilized drugs– freeze-dried drugs. Vaccines are transformed from liquid to solid powder. This process enhances shelf-life and stability of vaccines. Vapor products can be transformed directly to solid without the liquid phase, easing production. Medical device packaging– wrapping, packaging, preparing a medical device for shipping, display, and purchase. 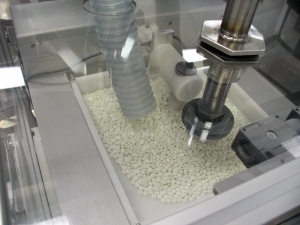 Devices, like the drugs themselves often need certain requirements for safe packaging, requiring sterility, shape and delicate protection, certain temperatures, or other such necessities. A difficult business to be in, because of the requirements for entry and procedure. Nutraceuticals– refers to foods claiming to have a medicinal effect on human health. Also called functional foods. Some examples are Flavanoids, Anti-Oxidants such as gamma linolenic acid, beta carateins, anthocyanins, etc. OTC Products– Over The Counter products. Medical or healthful products that can be purchased over the counter without a prescription. Package design– the art and technology of enclosing or protecting products for distribution, storage, sale, and use. More specifically it is the design and layout of the package structure and labeling integrated with the products use and necessities. Package testing– tests to ensure that packaged products will survive the environmental hazards of temperature, humidity, shock, vibration, compression, altitude or impacts when shipped to customers. Packaging automation– the world of machinery and production behind packaging controls and information technologies. Relating physical machinery and design imagery. Parenterals– medicine taken into the body or administered in a manner other than through the digestive (alimentary) tract, as by intravenous or intramuscular injection. Total parenteral nutrition (TPN) is meant to drip through a needle or catheter placed in a vein. TPN is used for patients who cannot or should not get their nutrition through eating. Patient compliance– refers to a patient both agreeing to and then undergoing some part of their treatment program as advised by a medicine package, their doctor, or another healthcare worker. Personalized medicine– personalized medicine would allow a doctor to prescribe precisely the right drug at the right dose to an individual based on that person•s unique DNA. A possibility stemming from the human genome project that would revolutionize the healthcare packaging industry. Process analytical technology (PAT)– a way to approach validation for pharmaceuticals since the FDA regulations associated with CFR 21 part 11. RFID– Radio-frequency identification (RFID) is an automatic identification method, relying on storing and remotely retrieving data using devices called RFID tags or transponders. The current thrust in RFID use is in supply chain management for large enterprises. RFID increases the speed and accuracy with which inventory can be tracked and managed thereby saving money for the business. Risk management– Risk management is the human activity which integrates recognition of risk, risk assessment, developing strategies to manage it, and mitigation of risk using managerial resources. Evaluate and work to prevent risks in the packaging field. Identify every possible risk scenario for all identified functions. Match those scenarios with their likely effect(s). For instance, if a stopper is not placed properly in a vial (a possible risk), the possible effects could include spilled product, product that•s underweight/under dose, or product that appears to have been tampered with. Senior friendly– a package that is designed with the elderly in mind, perhaps easy-open for those with less agile hands, perhaps with large-print type for those with failing vision, etc. Sterilization– any process that effectively kills or eliminates transmissible agents (such as fungi, bacteria, viruses and prions) from a surface, equipment, foods, medications, or biological culture medium. Sterilization can be achieved through application of heat, chemicals, irradiation, or filtration. Packaging medical devices and medicines to remain sterilized is then necessary. Tamper evident– a device or process that makes unauthorized access to the protected object easily detected. This may take the form of seals, markings or other techniques. Tamper-evident design is perhaps most visible in the area of product packaging and labelling, where it can be vital to know that the product has not been altered since it left the manufacturer. Track and trace– the process of recording the past and present whereabouts of a shipment, as it passes through different handlers on its way to its destination. Typical applications for Track & Trace are to identify where a product was “diverted” from its intended course (parallel importing), or where a fake product was introduced. 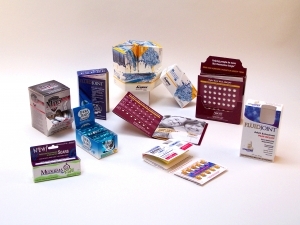 Unit – of – use packaging– packaging designed to be taken one dose at a time, often in a blister pack, to prevent the rest of the medication from being contaminated, or to easily keep track of how many have been taken and how many remain. This makes patient compliance easier. Validation– a total process involving the identification and control of materials and processing variables that affect the ability of a packaged device to meet its acceptance requirements. Involves knowing that the medicine you’re taking is the medicine you’re supposed to be taking, and that it hasn’t been tampered with.